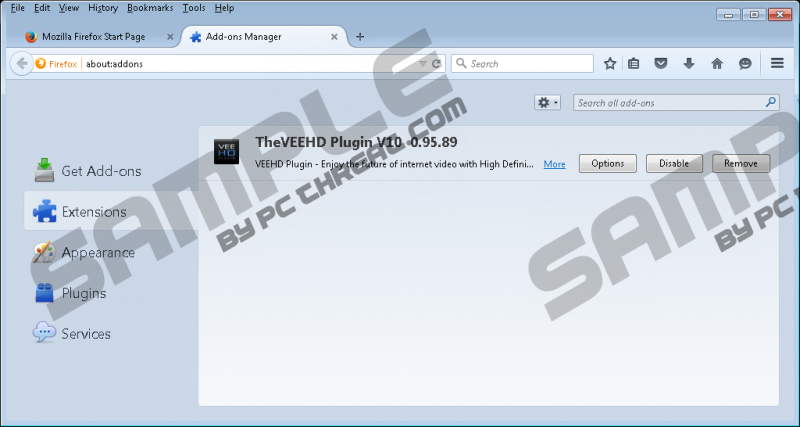 VeeHD is a browser-based adware application that you might want to remove. It seems that this extension has been developed only to display commercial content. However it is advertised as a piece of software that will enable you to access unlimited high definition streams delivered from its sponsored video platform. This application mainly aims to promote its website Veehd.com, but it might show third-party ads as well. We do not recommend keeping this application, because your computer might get even more adware applications that might drastically slow it down and cause a lot of inconvenience to you. VeeHD is owned by the same people who own the website Veehd.com, and the plug in can be downloaded from the developers website at Plugin.veehd.com. However, we could not download the application from this website when we tried. In any case, this application can also be found on Software.informer.com. The software distributing website hosts downloads of several different versions of this application. It can also be found bundled with the InstallDaddy download manager. So this application has no shortage of distributors. In addition to that, it must be said that by installing VeeHD you might also install additional malware. Browsing the Veehd.com website, which hosts videos, is also a frustrating experience because it constantly renders pop-ups that redirect to third-party websites. Furthermore, the website displays banners that redirect to pages that feature malicious downloads, such as VideoDownloadConverter toolbar, TelevisionFanatic toolbar, and so on. It does not seem that bad, but, still, the purpose of this application is definitely not to enhance the video quality or anything like that. Browser extensions cannot do that. It seems that the only purpose of VeeHD is to display commercial advertisements that, as we have seen for ourselves, are very irritating. Most of the ads promote potentially unwanted programs, adware, and bad toolbars. So we do not think having this application installed is such a good idea. The website also contains its fair share of ads, so it is advisable to avoid clicking the them. We recommend getting an adblock program if you insist on visiting the website. So take action and remove VeeHD using the removal guide found at the bottom of this article. Find the unwanted program and click Remove. Right-click on the Start Screen logo. Launch the browser and simultaneously press Alt+T. Find VeeHD and click Remove/Disable. Go to Add-ons and select Extensions. Find VeeHD and click Remove. Go to Settings and select Extensions. Quick & tested solution for VeeHD removal.